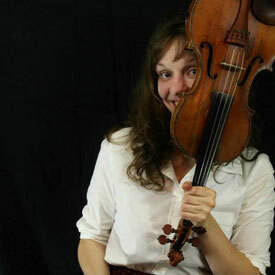 Rachel is a Wisconsin based freelance Bluegrass and Americana fiddle player. Rachel started playing classical violin at the age of 5, but has always been a fiddle player at heart. With a family heavily involved in the music scene, and a professional banjo player for a dad, she grew up always surrounded by Bluegrass and American Country Music. Rachel's first words were even Bob Wills; classical to country was just a natural progression. She started working professionally as a fiddle player at the age of 15. Rachel is best known as a founding member of the Back Alley Blossoms, a regionally touring Americana band out of Stevens Point, Wisconsin. Rachel has regularly appeared with other regionally popular groups Sloppy Joe, Saint Anyway, and Tin Can Gin. Currently she plays with Duluth based Bluegrass band Borderstone. Rachel is also known for her unique jug playing technique that allows her to play melodies on the jug. She will be graduating with a BA in history and music at the University of Wisconsin Superior this May.